On Friday, July 15 a few dozen people hugged, chatted, and greeted each other warmly as they milled around the Lunder Gallery at Maine College of Art (MECA) in Portland. This gathering of the Portland arts community was for The Inspiration of Abstraction, a collaboration between the Bates Dance Festival and MECA, presenting choreographer Doug Varone in conversation with abstract painter Michel Droge, looking collectively at the pastels of painter Joan Mitchell and their influence on Varone. Collaboration, conversation, and influence were the themes of the evening, leaving the audience with a deeper view into the mind of the abstract artist. The event opened with introductions by BDF Director Laura Faure. Faure stressed that the evening was the first collaboration between these two Maine art organizations since 2000. Next Michel Droge led the audience through a slide show of her work, describing her research process. 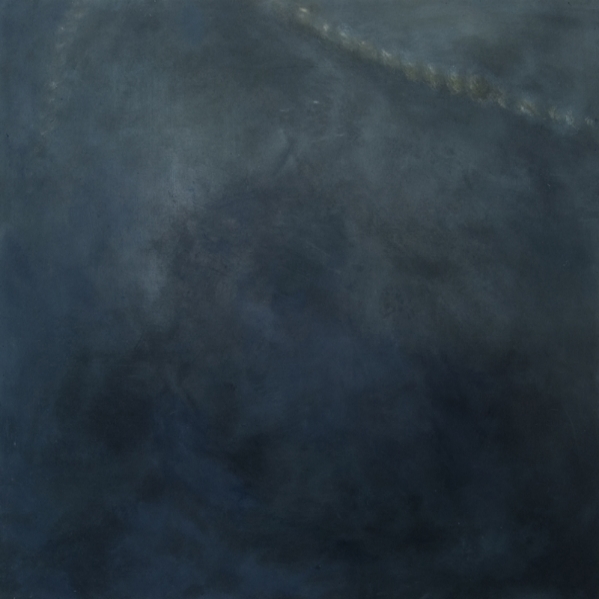 Each collection of paintings stems from a different inspiration: her Requiem series was built on the “liminal spaces” of sunset and sundown she witnessed while walking the coast of Maine. The collection Tiny Catastrophes came from climate change and the aurora borealis. Droge’s influences extend beyond nature to Greek philosophy, poetry, and more. Next Varone joined Droge, and reminded the audience how hard it is for artists to talk about their work. He spoke of dance as an abstract form, and said that he too feels like a painter, using bodies architecturally to tell a story. Yet he differs from Droge and other visual artists in that his art form constantly regenerates itself. He spoke about the contrast of dances in his canon as painting with different palates and colors. Like Droge, Varone went through examples of his work and spoke on the many influences that spark his creation. He showed clips of two pieces, Carrugi (2012) and Rise (1993), and what influenced them: fiction, music, etc. Next he moved onto ReComposed, a work that premiered last summer at the American Dance Festival, which he’ll present here at BDF this coming weekend. 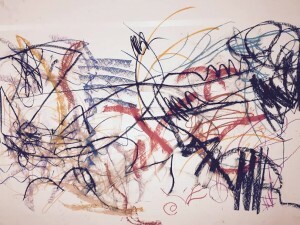 ReComposed, Varone explained, differs from his other works in that it’s a piece of art based on another artist’s work – Joan Mitchell’s complex and abstract pastels. In many of the works parts are smudged out; Varone explained that once Mitchell was diagnosed with cancer she slowly erased parts of her drawings to reflect her own life. 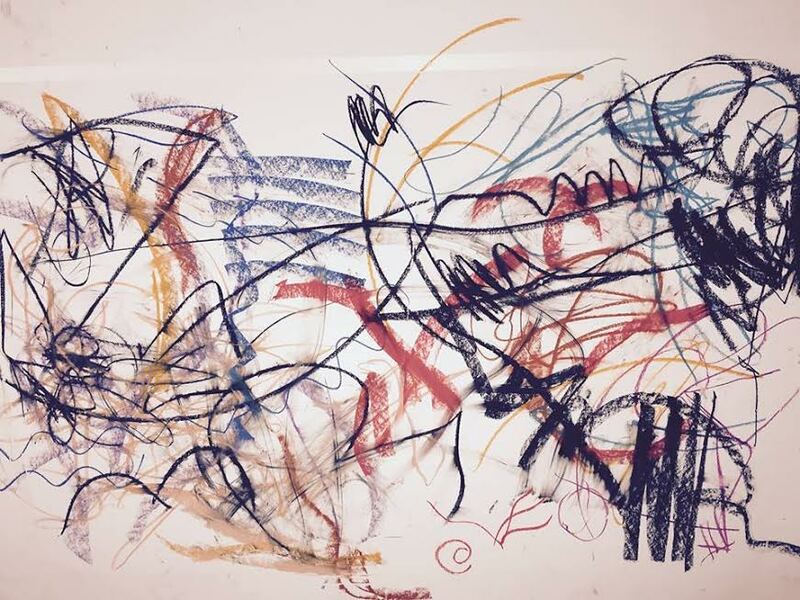 To create ReComposed Varone and his dancers looked at sections of their favorite pastels and created written phrases from which they made movements. On Friday Varone was joined by two of his dancers, Xan Burley and Alex Springer. Burley and Springer demonstrated this process. Varone read some of the phrases they’d created: “chronicle, sanctuary, allude most bare, defiant yet lyrical, holding attention, edges unfinished, awkward and open, interior weather, unruly precision, etc,” while Burley and Springer enacted the gestures in movement. Next Varone placed them close together, so they were forced to weave in and out, improvising partnering as they danced. Next, the spirit of community and collaboration shone in earnest: Varone invited the audience to make a dance. Varone called on a number of audience members at random to pick their favorite part of a Mitchell pastel. Each participant saw something different: two yellow lines that look like French fries, seagulls, Winston Churchill, a needle. Varone summarized what each person said into a concise phrase, and both Burley and Springer turned it into a movement until the two dancers had accumulated a rough minute long duet created through improvisation. Burley and Springer moved in a full and liquid way; they express perfectly Varone’s signature juxtaposition of looseness and control. The pastel created by audience members. For the next step of the project, Droge and her assistant taped a huge piece of white paper to the floor. Five volunteers chose pastels from a box, and then they were instructed to draw what they saw while Burley and Springer went through their duet. A second group was called up to add to the drawing. At this point, they’d created a pastel based on a dance based on a pastel. And it wasn’t over yet. Varone and Droge held up this new drawing for the audience to see then taped it back to the floor. Lastly, Varone asked his dancers to improvise for one full minute based on what they saw in the drawing, and then to do the same for five seconds. At this point, as Varone said, the process had come full circle: pastel to dance to pastel to dance. The Inspiration of Abstraction gave audience members a deeper understanding of the split second, impulse decisions that turn into art. Varone closed by saying that his dances are never done; that the ephemerality of dance is both what he loves and hates the most. This is just the beginning of Varone’s residency at BDF. This summer marks his tenth at the Festival. See Doug Varone and Dancers perform ReComposed and two other works this Friday and Saturday at the Schaeffer Theatre.